A RUP LIFE: Norm of the North #Review & Free Printables! Norm of the North #Review & Free Printables! This is our movie night feature pick - Norm of the North! This movie is just plain fun and my kids have laughed through the whole movie. Norm is a little different he can speak to humans and sings and dances. He is on a mission to save the Artic and lands himself in New York City! Cute lemmings and an adorable bear - what more could you want for movie night! 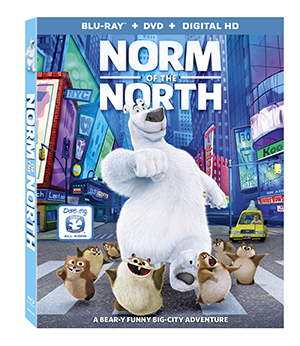 This new movie is packed with laughs, music, fun characters and heart, Norm of the North is a must-own for the entire family! Bring home this heroic adventure now on Digital HD and coming to Blu-ray Combo Pack Tomorrow!